The San Diego Padres made two trades Tuesday, and each included two former Midwest League players. The first trade involved the Padres sending outfielder Jabari Blash to the New York Yankees for third baseman Chase Headley and RHP Bryan Mitchell. The second trade was a one-for-one deal that sent infielder Ryan Schimpf from San Diego to the Tampa Bay Rays for minor-league infielder Deion Tansel. Of those five players, only Mitchell didn’t play in the Midwest League. Blash played 155 games with the 2011-12 Clinton LumberKings, cumulatively batting .239 with 18 HR, 63 RBI and 18 SB. He made his major-league debut for the Padres in 2016, and appeared in 99 games for the team over the past two seasons. He batted .200 with 8 HR and 21 RBI in those games. Headley briefly played for the 2005 Fort Wayne Wizards, going 3-for-15 with a walk, a run batted in, and two runs scored in four games. He made his MLB debut for the Padres in 2007, was traded to the Yankees in 2014, and resigned with New York as a free agent before the 2015 season. His best year in the majors was 2012, when he finished fifth in the National League MVP vote after batting .286 with 31 HR, 115 RBI and 17 SB in 161 games. Schimpf was drafted by the Toronto Blue Jays in 2009 and spent most of the 2010 season in the Midwest League, where he batted .240 with 6 HR, 45 RBI and 11 SB in 92 games with the Lugnuts. His 39 extra-base hits for Lansing included 23 doubles and 10 triples. He made his major-league debut for the Padres in 2016 and appeared in 142 MLB games during the past two seasons. He batted .195 with 34 HR and 76 RBI in those games. Tansel hasn’t played a regular-season game in the Midwest League, but was a postseason addition to the Bowling Green Hot Rods roster in 2016, the year he was drafted by the Tampa Bay Rays. He played rookie ball during the regular season that year, and played in the short-season New York-Penn League in 2017. 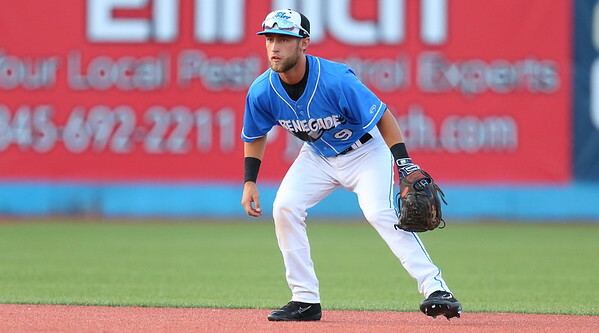 (He batted .277 with 3 HR, 33 RBI and 7 SB in 53 games with the Hudson Valley Renegades this year.) He has yet to play in a full-season league, so he probably will play in the Midwest League in 2018, in which case he would suit up for the Fort Wayne TinCaps. This entry was posted in 2016 Playoffs, Bowling Green Hot Rods, Clinton LumberKings, Fort Wayne TinCaps, Hudson Valley Renegades, Lansing Lugnuts, Midwest League, New York-Penn League. Bookmark the permalink.